Henry Bacon, one of America’s foremost architects, was born in 1866 and died in 1924. Working for McKim, Mead & White in New York, in 1889 he won a Rotch Traveling Schol­arship, traveling to Europe for two years where he studied classical architecture. In Paris he studied the Beaux Arts style of architecture, so named be­cause it was taught at the Ecole des Beaux-Arts. He re­turned to McKim, Mead & White where he worked until going into partnership with another Rotch Scholarship winner. In 1903 he opened his own firm. The Beaux Arts style is charac­terized by symmetry, formal design, and elaborate orna­mentation. It features large and grandiose compositions, symmetrical facades, flat low-pitched roofs, walls of ma­sonry, arched windows and doors, paired colossal columns, wall surfaces with decorative garlands, floral patterns, and sculptural ornaments. Bacon’s contribution to the American interpretation of Beaux Arts design was pure classicism born of his great love for Ancient Greek and Roman art and architec­ture. But his most significant legacy to American architec­ture was his collaboration with some of the foremost sculptors of his day, including Daniel Chester French, who created the statue of Abraham Lincoln for the Lincoln Memorial, Ba­con’s most famous work. In 1923 President Harding pre­sented Bacon with the American Institute of Architects’ Gold Medal, its highest award. In the 1890’s, John Howard Whittemore, Naugatuck’s lead­ing industrialist, transformed the character of the industrial vil­lage. He commissioned McKim, Mead & White to design the town green as well as a series of institutional buildings in the Neoclassical and Second Ren­aissance Revival Style. He was thought to be influenced by Chicago’s Columbian Exposition in 1893, which featured “The White City,” and which led to the “City Beautiful Movement” sweeping across the country with a sea of magnificent public buildings of polished stone. Henry Bacon designed three of these Naugatuck structures and may have been involved with others with McKim, Mead & White. The most famous was the railroad station. Its Spanish Colonial Revival design was a departure for Bacon, noted for his classical design. Although the Spanish influence was strengthened by the roof tile and stuccoed walls, the basic plan reveals Bacon’s prefer­ence for classical design. When John Howard Whittemore died in 1910 his widow selected Henry Bacon to design the Whittemore Memo­rial Bridge. 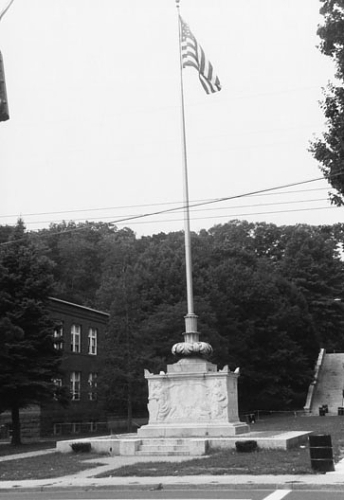 It was built by public subscription to honor Nauga­tuck’s leading citizen and still spans the Naugatuck River at Maple Street. Unfortu­nately, Bacon’s classical marble railings for the shallow arched span were lost in the 1955 flood. 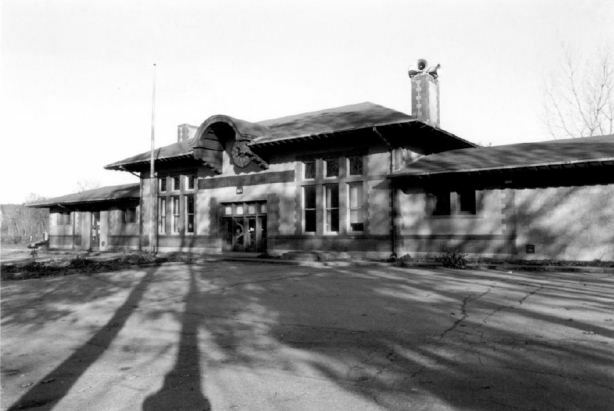 Henry Bacon’s rail­road station now houses the Naugatuck Historical Soci­ety Museum. Editor’s Note: A similar version of this article was originally written for a Women’s Study Club project and first appeared in the Naugatuck Historical Society’s Newsletter. Elaine Russell is a longtime resident of the area and a member of the Society.